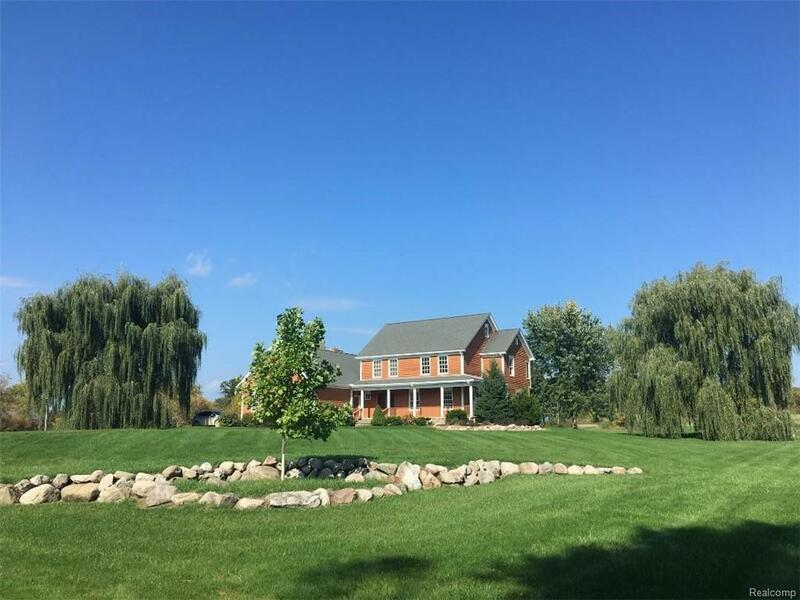 Remarkable Builders custom home is situated on 12.6 acres in Metamora with Oxford Schools. Cedar and stone exterior, with wrap around porch. Quality throughout. Details include solid wood interior doors, thick base molding, wood trimmed windows, Heart Pine wide planked wood flooring. Chef's kitchen with top of the line appliances and Cherry LaFata Cabinets. Patio off Breakfast room. Dining room offers french doors opening onto wrap around porch. Outstanding Family room window with vast views of the backyard, Stone fireplace with wood burning insert. Master bedroom with gas fireplace, dual closets one a walk in + linen closet. Master bath boast a jetted tub, Separate shower, dual sinks and a water closet. Rec Room/Office/Theater room is located on the 3rd level. Sprawling unfinished LL with stone fireplace, walk up stairs to exterior & plumbed for a bath. 2+ car garage with upper level storage & wash basin. 24' x 27' cement pad is ready for an out building. Geo-Thermal HVAC.